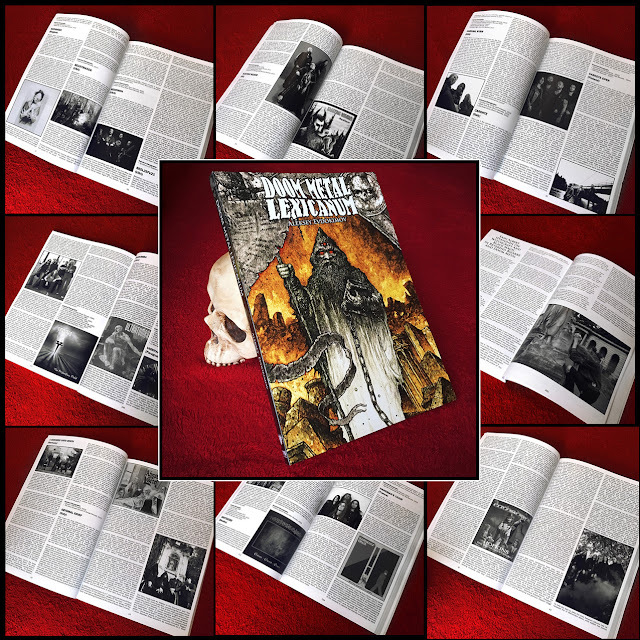 Cult Never Dies and Crypt Publications proudly present our first work dedicated to doom metal, the truly epic and encyclopedic work known as the DOOM METAL LEXICANUM by doom fanatic Aleksey Evdokimov. Featuring a massive 300,000 words, our first tome dedicated to doom metal focusses on the traditional side of the genre and explores traditional doom, stoner doom, epic doom, and various related hybrids. 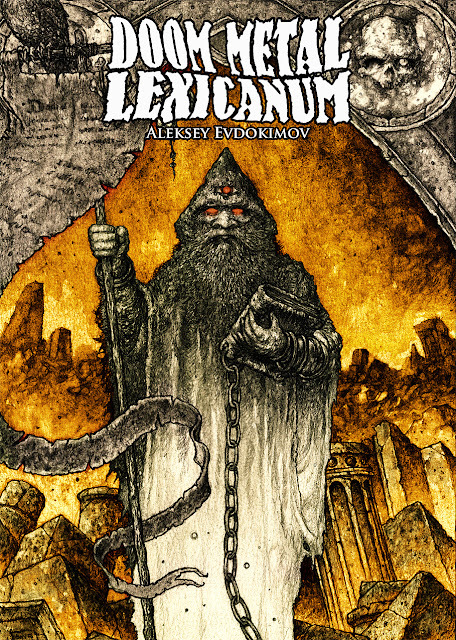 "As impressive as a weighty doom riff… It might be a cliché but DOOM METAL LEXICANUM is mandatory reading and ownership for all doom fans. It is highly unlikely this book will be surpassed in the near future." "And that's the magic here: where some books retread old ground and retell stories you already know, Doom Metal Lexicanum is a journey into a new world for newbies and doom experts alike." "...educate, entertain and amuse at its own pace... That is what a book like this should do, and Doom Lexicanum does it in spades. It is an absolute joy. Aleksey, take a bow and probably a well deserved rest too... You like doom? Of any kind? You need this. End of." "This book is as essential to Doom fans as vinyl copies of the first six BLACK SABBATH albums..."
"There are over 350 bands examined in every corner of the globe and militants between classic doom, stoner doom, epic doom, funeral doom and similia, composing one of the best (if not the best, in terms of completeness...) encyclopaedic works currently on the market on this metal niche." Sickness Unto Death, Abysmal Grief, Acid King, Aeon Aphelion, Aeonsgate, Age Of Taurus, Alastor, Albino Python, Albinö Rhino, Altar Of Oblivion, Alucarda, Alunah, Ancestors, Ancient Spell, Ancient Warlocks, Angel Of Damnation, Anguish, Apostle Of Solitude, Appey & The Pea, Arcana, Archarus, Arc Of Ascent, Argus, Arkham Witch, Army Of Dagon, Atlantean Kodex, Avatarium, Aye-Aye, BST, Barabbas, Bathseba, Beastmaker, Bedemon, Beelzefuzz, Bevar Sea, The Black, Black Capricorn, Blackfinger, Black Hole, Black Lung, Black Medicine, Black Moth, Black Oath, Black Prism, Black Pyramid, Black Rainbows, Blackwülf, Blizaro, Blood Ceremony, Blood Farmers,Bloody Hammers, Bomg, Book Of Wyrms, The Bottle Doom Lazy Band, Bretus, Burning Saviours, Camel Of Doom, Candlemass, Capilla Ardiente, Cardinals Folly, Cardinal Wyrm, Caronte, Caskets Open, Castero, Castle, Cathedral, Cauchemar, Children Of Doom, Church Of Misery, Church Of Void, Conan, Condenados, Corman, Count Raven, Coven, Crimson Dawn, The Cross, Cross Vault, Crowned In Earth, Cruthu, Crypt Sermon, Dantesco, Dawn Of Winter, Dawnrider, Dead Temple, Dead Witches, Death Penalty, Demon Eye, Demon Head, Demon Lung, Desolate Pathway, Devil, The Devil’s Swamp, Djinn And Miskatonic, Doctor Cyclops, Doctor Smoke, Domovoyd, Doomdogs, Doomraiser, Doomshine, Doom’s Day, Dragonauta, Dread Sovereign, Dreaming, Earthride, Elder, Electric Wizard, Elephant Tree, El Hijo De La Aurora, Elliott’s Keep, Epitaph, Eternal Elysium, Ethereal Riffian, Evangelist, Evoke Thy Lords, Fall Of The Idols, Fangs Of The Molossus, Fangtooth, Flesh Of The Stars, Forsaken, Forsaken Peddlers, Fox, Frank Sabbath, Funeral Circle, Funeral Mantra, Funeral Marmoori, Gallileous, Gallow God, Garden Of Worm, The Gates Of Slumber, Goatess, Godwatt, The Grand Astoria, Griftegård, Hands Of Orlac, Hangman’s Chair, Haunted, The Hazytones, High Fighter, High Priest Of Saturn, Holy Grove, Holy Serpent, Hooded Priest, Hornss, Hound, The Hounds Of Hasselvander, Hour Of, The House Of Capricorn, Huata, I Compagni Di Baal, Indica, Infinite Flux, Internal Void, Iron Hearse, Iron Man, Iron Void, Isole, Jack Frost, Jess And The Ancient Ones, Jex Thoth, John Gallow, Kannabinõid, Khemmis, Khthon, King Heavy, Kingnomad, Kings Destroy, Kin Of Ettins, Kroh, Kröwnn, Krux, KYPCK, The Lamp Of Thoth, Landskap, L'Impero Delle Ombre, Lord Of Doubts, Lord Vicar, Lord Vigo, Lucifer, Mage, Magic Circle, Magister Templi, Magma Rise, Mahakala, Mammoth Storm, Mangog, Marble Chariot, Marchafunebre, Matus / Don Juan Matus, Megatherium, Mephistofeles, Merlin, Messa, Midryasi, Minotauri, Mirror Of Deception, Misantropus, Misty Grey, Misty Morning, Monasterium, Monolith, Monolith Wielder, Monolord, Mood, Moonbow, Moon Curse, The Moon Mistress, Mortalicum, Moss, Mothersloth, Mother Witch & Dead Water Ghosts, Mountain Of Judgement, Mountain Throne, Mountain Witch, Naevus, Naked Star, Nekromant / Serpent, Night Gaunt, Ningen Isu, Nomad Son, Northwinds, Obelyskkh, Obrero, The Obsessed, Obsidian Sea, Occultation, Ogre, Olde, Old Sea And Mother Serpent, Opium Warlords, The Order Of Israfel, Organ, Orodruin, Orthodox, The Ossuary, Otehi, Oyabun, Pagan Altar, Palace In Thunderland, Pale Divine, Pantheist, Peacemaker, Penance, Pentagram, Pesta, Phased, Pilgrim, Place Of Skulls, Plöw, Pohjoinen, Pombagira, Premarone, Procession, Project Armageddon, Prophets Of Saturn, Psychedelic Witchcraft, Purple Hill Witch, Pÿlon, Realmbuilder, Red Wizard, Reino Ermitano, Return From The Grave, Revelation, Reverend Bizarre, RIP, Rituals Of The Oath, Sacrieledge, Sacro Sanctus, Saint Vitus, Sancta Sanctorum, Satan’s Satyrs, Satori Junk, Saturnalia Temple, Saturndust, Scald, The Scimitar, Seamount, Sepulchral Void, Seremonia, Serpent, Serpent Venom, Serpent Warning, Sidhe, Simon Magus, Sinister Haze, The Skull, Skyler Alexandre, Sleep, Slow Green Thing, Solace, Solitude Aeturnus, Solstice, Son Of A Witch, Sorcerer, Soul Of Enoch, Space God Ritual, The Spirit Cabinet, Spirit Descent, Spiritus Mortis, Stangala, Stars That Move, Stereochrist, Stonebirds, Stoned Jesus, Stonegriff, Stonewitch, Strange Here, Subrosa, Succubus Irons, Summoner, Surtr, Taak, The Temple, Terra Firma, Three Eyes Left, Tlon, Tombstoned, Tony Tears, Tortured Spirit, Trouble, Ultratumba, Umbrarum Regni, Uzala, Vampyromorpha, Venomous Maximus, Vinum Sabbatum, Void King, Void Moon, Vokonis, Vomit Monster, Wall Of Sleep, The Wandering Midget, Wardenclyffe, Warning, Weed Is Weed, The Well, Well Of Souls (Ger), Well Of Souls (USA), Wheel, Wicked Inquisition, Windhand, Witch Charmer, Witchcraft, Witchfield, Witchfinder General, Witchhelm, Witching Altar, Witch Mountain, Witchskull, Witchsorrow, Witchthroat Serpent, With The Dead, Without God, The Wizar’d, Wizard Eye, Wo Fat, Wolf Counsel, Wounded Giant, The Wounded Kings, Wretch, Yama, Year Of The Cobra, Yidhra, Zaum.